The majority of the early Roses to the colonies were from Great Britain - English, Scottish, Irish, Welsh - all made their mark in the colonies. One of the best chronicled Scottish Rose families is that of Rev. Robert Rose of Morayshire, Scotland and Colonial Virginia. He came to Virginia about 1725, and lived in Essex and Albemarle Counties. He was followed shortly thereafter by his brother Rev. Charles Rose of Westmoreland County, Virginia, and also by brothers Alexander and John. This family has a proven lineage to the Rose Clan of Kilravock Castle. This Castle is still in existence in Scotland near the village of Croy, and is available as an inn with wonderfully historic accommodations. The photograph at the left is from the front; that on the right is from the rear of the Castle. 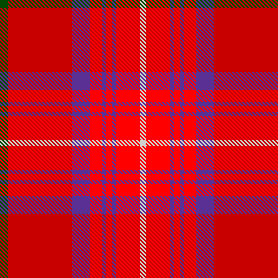 Below, the red tartan is the ancient Rose tartan of the Scottish clan; the green is the hunting tartan. A genealogy, Ancestors and Descendants of the Brothers Rev. Robert Rose and Rev. Charles Rose was compiled by Christine Rose, CG, CGL, FASG and published and beautifully printed in hardback, xiv, 318 pages, illustrated and indexed, in 1985. It was the recipient of the Donald Lines Jacobus award, and is still available from the Rose Family Association for $25.00 plus $3.50 postage. Also available is a reprint of the scarce Family of Rose of Kilravock, compiled by Hew [Hugh] Rose and published originally in Edinburgh, Scotland in 1848. This remarkable and unique book has been reprinted in its entirety, hard cover, and is also available from the Rose Family Association for $25.00 plus $3.50 postage. Though this Virginia Rose family was prominent and left many records, it is only one of the many early Rose families from Great Britain. Preceding the Rev. Robert Rose family by over 100 years was the Robert and Margery Rose family who sailed from Ipswich, England in 1634 on the ship Francis. Any connection between them and the Scottish Roses it not yet known. The Robert Rose family lived in Wethersfield, Connecticut and later in Branford, Connecticut. This family is the largest of all the Rose families in the United States, and is now scattered throughout the nation. A genealogy was compiled by Christine Rose, CG, CGL, FASG and published in 1983, and is still available for $38.50 plus $4.00 shipping. It contains xvi, 512 pp., illustrated, hard cover, fully indexed. It was the recipient of the Donald Lines Jacobus award in 1987. It is still available for $38.50 plus $4.00 postage. Besides these two large Rose families mentioned, there were m any others from Great Britain who arrived by the end of the 19th century, including a significant number from Ireland. Many of the research reports of the Rose Family Association are based on descent from various of these Roses. In some instances, the immigrant ancestor is not yet known, so the report starts the earliest known Rose until the immigrant can be established. In other cases, the immigrant is known, and the report starts with that immigrant. All the available reports are listed on our home page.